Floyd Mayweather, Jr. (44-0, 26 KO's) retained the WBC Welterweight title, outpointing Robert "The Ghost" Guerrero (31-2-1, 18 KO's) 117-111 on all three official scorecards. Guerrero matched Mayweather's hand speed early in the fight, especially in the first round. Whenever Mayweather threw a punch, Guerrero fired back immediately, forcing the undefeated pound-for-pound king to make adjustments. As the fight went on, Mayweather brilliantly modified his game plan. While Mayweather, 36, struggled offensively in round two, he still managed to slip Guerrero's punches with ease. He started to land some lead right-hand shots, but Guerrero was right in his face. Guerrero, a southpaw, kept touching Mayweather with his right jab in the third round. In the last two minutes, however, Mayweather started to find his rhythm. Aside from being trapped in the corner shortly in round four, Mayweather used his distinguished boxing ability and superior reflexes to attain the upper hand. Mayweather's offense really began to click in round five, as he repeatedly struck Guerrero with his acclaimed lead right-hands. Guerrero's punch output dramatically dropped by the sixth round, as Mayweather discovered his comfort zone. When round eight rolled around, Mayweather could not miss with his punches. Mayweather's lead right hand was breaking through Guerrero's defensive guard smoothly. Guerrero came on in the ninth round, but Mayweather's craftiness made him hesitant to release his punches. As a result, Mayweather cruised in the championship rounds en route to victory. Abner Mares (26-0-1, 14 KO's) picked up the WBC Featherweight title, stopping a durable Daniel Ponce De Leon (44-5, 35 KO's) at 2:20 seconds of the ninth round. After both fighters released countless power shots the first two rounds, Mares feinted with a right and caught Ponce De Leon flush with a swift left hook to the face, flooring the champ with five seconds left in round two. Mares, clearly illustrating the superiority in hand speed, relentlessly attacked Ponce De Leon's body in the beginning of round three. Mares continued to beat Ponce De Leon to the punch in round four, as Ponce De Leon tirelessly charged forward. Employing his exceptional ring generalship, Mares dictated the pace in rounds five and six. In spite of this, Ponce De Leon kept pressuring Mares. Ponce De Leon struck Mares low in round seven with a left uppercut, and was warned from referee Jay Nady to keep his punches up. After that, Mares traded his right crosses with Ponce De Leon's straight left-hand shots the remainder of the round. Mares exerted a lot of energy in round eight, while Ponce De Leon patiently timed him with overhand lefts. Mares showed an abrasion under his right eye, and on his right shoulder following the end of the round. In the ninth round, Mares tagged Ponce De Leon with a sweeping overhand right, dropping him on his back instantly. Ponce De Leon, displaying massive swelling on his left cheek, was met immediately with a large volume of punches in the corner after rising to his feet from the knockdown. Feeling Ponce De Leon consumed too many clean punches, referee Jay Nady stopped the contest without delay. Leo Santa Cruz (24-0-1, 14 KO's) obtained the vacant USBA Junior Featherweight title, stopping a courageous Alexander Munoz (36-5, 28 KO's) in the fifth round. Time of the stoppage was 1:05. Santa Cruz, a high volume puncher, temporarily staggered Munoz with a right cross-left hook combination to the head in the middle of round one. Both men exchanged blow-for-blow at a heated pace in the second round, although Santa Cruz displayed the leverage in power. Munoz slowed toward the end of the round. In the third round, Santa Cruz peppered Munoz with a multitude of shots to the body and head. With fifteen seconds to go in the round, Munoz collapsed from the accumulation of punishing blows he absorbed from Santa Cruz, but rose to his feet before referee Vic Drakulich reached the count of ten. Santa Cruz continued his heavy assault in round four, almost dropping Munoz again just before the bell rang. Munoz appeared ready to quit on his stool after the round concluded. A minute into the fifth round, Santa Cruz sent Munoz sprawling into the ropes and onto the canvas after connecting with a hard left hook to the head. Referee Vic Drakulich had seen enough and halted the bout. J'Leon Love (16-0, 8 KO's) won via ten-round split decision over Philadelphia's Gabriel Rosado (21-7, 13 KO's), claiming the vacant NABF Middleweight title. The official scores were 95-94 in favor of Rosado, while Love received tallies of 95-94 and an astonishing 97-92 scorecard. Both Rosado and Love tried to establish control of the fight by throwing their left jabs in the first round. Love exhibited the edge in hand speed. Love, 25, got his punches off before Rosado in round two, but Rosado nailed him with a flush right cross to close the round. Rosado gained confidence in round three, backing Love up with the jab.With under a minute to go in the round, Rosado caught Love again with a timely right-hand shot to the chin. In the beginning of the fourth round, both fighters connected with rights to the body. Rosado struck Love repeatedly with right crosses to the head. Working behind a steady left jab, Love controlled the action in round five. Rosado, 27, displayed minor swelling under his right eye as the round concluded. In a close sixth round, Love unleashed more combinations as Rosado furiously pressed the action. All of a sudden, Rosado landed a powerful right-hand shot that sent Love to the canvas with six seconds left in the round. It was the first time Love was floored in his professional career. Love regained his composure at the start of round seven. Yet, Rosado got the better of the exchanges at the midway point, connecting once again with the overhand right. Love and Rosado brawled toe-to-toe in the eighth round. After Love dropped his mouthpiece, he briefly stunned Rosado with a clean right cross. 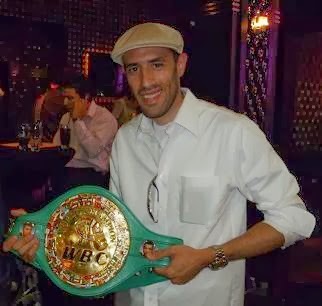 Love exhibited a sturdy chin after Rosado hammered him with right hands in succession during the ninth round. In a closely contested tenth round, Rosado landed the cleaner punches, striking Love with straight rights. 22-year-old Luis Arias (5-0, 3 KO's) captured a six-round majority decision victory against Donyil Livingston, 28, (8-3-1, 4 KO's) in a highly competitive super middleweight contest. Official scores were 58-56, 58-55 and 57-57. Both men unleashed vicious bombs early in round one. However, Arias displayed the edge in power. In round two, Livingston utilized his left jab effectively. Late in the round, Arias caught Livingston with a series of overhand rights and rock-solid body shots, dramatically slowing down Livingston's assault. With a minute left in round three, Livingston connected with a wide left hook, followed by a flush right hand to the head that momentarily stunned Arias. Arias answered in round four, landing a brutal right uppercut as Livingston's back was against the ropes. Moments later, Arias scored with consecutive left hooks to the body. The two battled fiercely in close quarters throughout the fifth round. Despite absorbing some grueling punches during the course of the bout, Livingston closed very strong, backing up Arias late in the sixth round. Light heavyweight prospect Badou Jack, 29, improved his professional record to (14-0, 10 KO's) by stopping Michael Gbenga (13-8, 13 KO's) with a well-timed, right uppercut to the body in the third round. Time of the stoppage was 2:26. Lanell Bellows (4-0-1, 4 KO's) kept his undefeated record intact, stopping Matt Garretson (2-1, 1 KO) in the fourth round.